Brazil, the eighth-largest economy in the world, has experienced an anemic recovery from its 2014 recession. Fitch Ratings and DBRS downgraded Brazil’s junk sovereign credit rating in 2018 due to the country’s steep fiscal deficits, escalating public debt and poor reformation activity. Newly elected President Jair Bolsonaro will need to make significant changes to right size the economy. Amid currently poor business conditions, corporations with high financial risk should be carefully monitored. Brazil’s economic troubles have been long-lasting with flat-to-negative GDP growth going back to 2014. Brazil’s fiscal deficit has also been severe, expanding as far as 10% relative to GDP, partly due to aggressive spending to keep the economy afloat. Despite this fiscal stimulus, unemployment stands at a decade-high of more than 12%. With its persistent budget deficit, public debt has ballooned and will continue to rise for the foreseeable future. Borrowing rates also remain excessive – trending between 6.5% and 11% across Brazil’s yield curve. These economic challenges have impacted public companies. At the depths of Brazil’s recession, the FRISK® Stress Index peaked at around 2.5. This figure indicates that aggregate public company financial stress was about 2.5 times worse compared to normal economic periods. At the depths of Brazil’s recession, the FRISK® Stress Index peaked at around 2.5. One noteworthy example is Liq Participacoes SA. This large operator offers customer relationship management and marketing. Some of Liq’s customers are located in Brazil and throughout Latin America. Its sales have declined by double digits for several years, where a portion of lost revenue was due to Oi SA, one of the major telecom providers. Oi SA filed for Judicial Reorganization in mid-2016 and had to make significant cuts to its operating structure. Other customers also cut spending, which has negatively impacted Liq. Liq’s FRISK® score has fallen from a “3” to a “1” within the last 18 months, highlighting extreme financial stress. 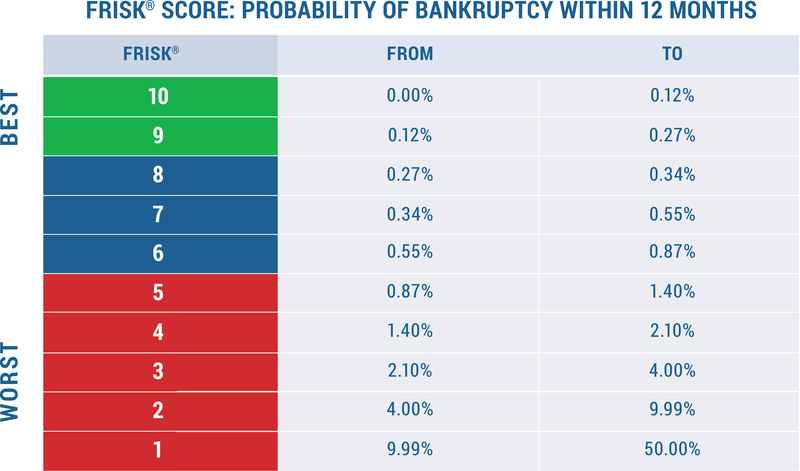 A score of “1” indicates a 10-to-50% probability of corporate failure in the coming year. Liq’s FRISK® score has fallen from a “3” to a “1” within the last 18 months, highlighting extreme financial stress. Liq completed a distressed debt exchange during 2018, paring down its outstanding debt. However, the company’s total liabilities relative to total assets still measures an extremely high leverage ratio of 95%. Tangible net worth has also been persistently negative. Regarding performance, annualized net sales are 1.5 billion Real (or $400 million), but its gross margin has fallen to negative 2% on a trailing 12-month basis. This trend reflects aggressive competition and the lack of pricing power afforded by its business model. Simply layering in selling, general and administrative expenses, as well as interest costs leave the company generating massive net losses. With negative free cash flow on the horizon, liquidity will be significantly pressured in the coming 12 months. Those who do business with Liq need to monitor the company’s dwindling cash position, which could lead to corporate failure if performance doesn’t improve. Brazil maintains a junk sovereign credit rating, whereby borrowing rates are expensive and business conditions broadly remain weak. If the Brazilian economy were to make a turn for the worse – which could stem from either internal or external factors – red zone corporations would be severely exposed. Liq Participacoes SA is just one example that has deeply suffered from long-lasting weakness in Brazil’s economy. Unfortunately there are many more troubled names to watch in the country, with about 40% of Brazilian public companies in the high-risk FRISK® score red zone. If you do business with any international company, the CreditRiskMonitor service can help protect your business. *As backtested on U.S. public companies; results may vary for private companies and by country. All references to the FRISK® score’s accuracy on the CreditRiskMonitor website are qualified by this statement.